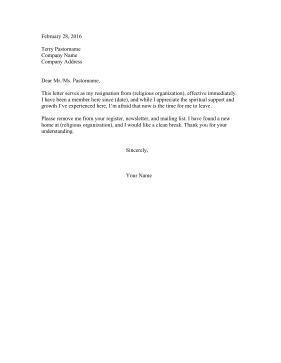 This printable resignation letter can be used when withdrawing from a religious organization. This letter serves as my resignation from (religious organization), effective immediately. I have been a member here since (date), and while I appreciate the spiritual support and growth I've experienced here, I'm afraid that now is the time for me to leave. Please remove me from your register, newsletter, and mailing list. I have found a new home at (religious organization), and I would like a clean break. Thank you for your understanding.